When travelling over snow, and skis or snowshoes are not being used, the principles of movement over rocky terrain apply. No special techniques are required when the snow lies over a foundation of other than glacier ice and when the terrain is not steep. The success of the operation depends on proper route selection and on using procedures that reduce exertion. 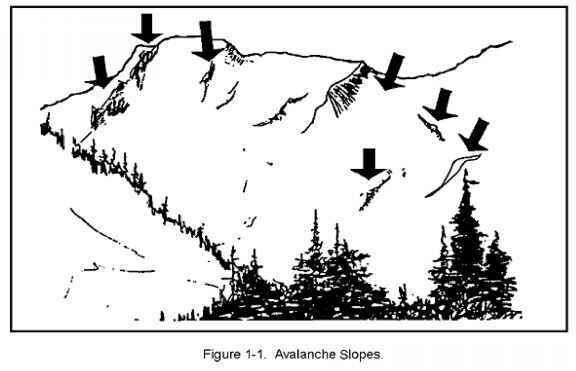 Movement on snow includes but is not limited to walking on low-angle slopes; snow climbing on steeper angles; descending; security on snow; snow anchors; and snow climbing roped in. Rest step. The rest step is used while walking on all angles of snow to allow the leg muscles to relax. After each step, the rear leg supports the full body weight by extending and locking the rear knee. Pace should be slow but steady with methodical breathing. Step kicking. 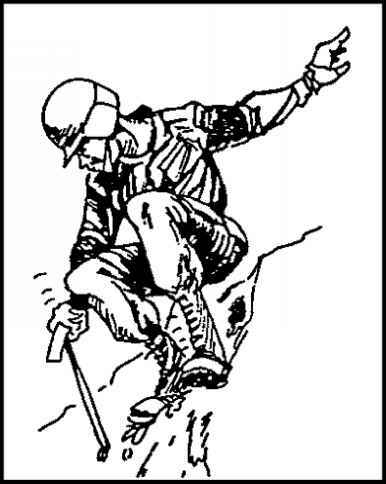 Step kicking is performed on moderate angles when crampons are not worn. Hold the ice axe like a cane with the palm over the adze and the thumb under the pick. Plant the ice axe, with the spike down, into the snow. With one foot, step up and kick a foothold into the snow. With the other foot, step up and kick a second foothold. With the body in balance, withdraw the axe and replant it an arm's length in front of the body. The ice axe can also be held in the stake position. Hold the head in one hand with the other grasping high on the shaft, and position the ice axe centered in front of the body. As the angle steepens, advance diagonally (Figures 1-18 and 1-19). 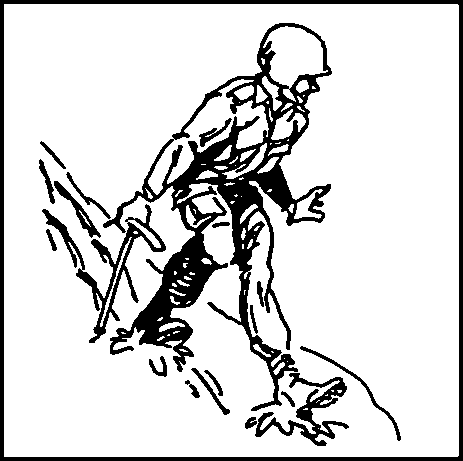 Successive soldiers should step in the same footsteps as the lead climber. 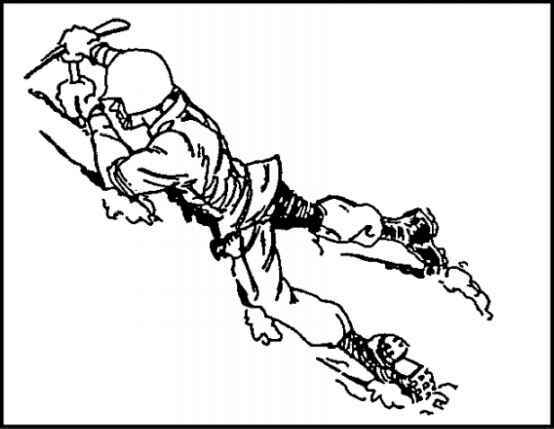 If the route is steep, hold the ice axe diagonally across the body (port arms position) with the spike thrust into the snow, almost at a 45-degree angle to the slope (Figure 1-20). As the route steepens, hold the axe diagonally across the chest but nearer to horizontal. Use the pick, rather than the spike. Force it into the snow in the arrest position (Figure 1-21). Snow Climbing on Steeper Angles. Diagonal ascent. 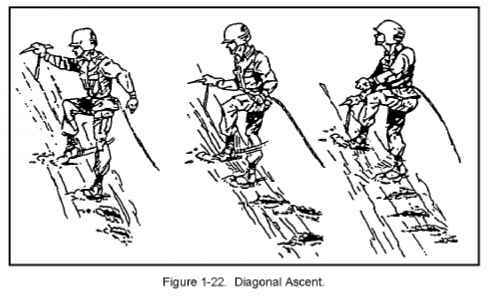 Use the diagonal ascent when a direct ascent becomes too steep. Hold the ice axe like a cane. Firmly plant the ice axe and walk up to the ice axe. Remove the axe and reposition it (Figure 1-22). 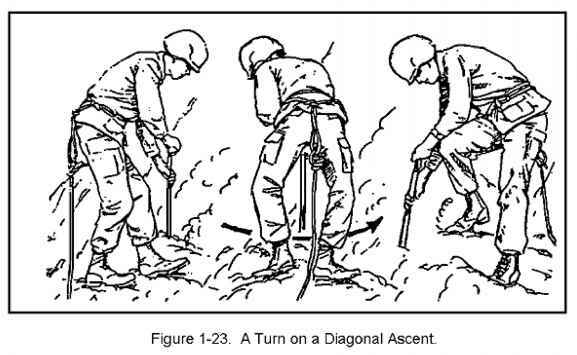 To change directions, plant the ice axe and grasp the ice axe head with both hands (stake position). Shift 180 degrees to the new direction, moving the feet one at a time and side to side. Keep the toes pointed out in a herringbone manner until the new direction is attained. 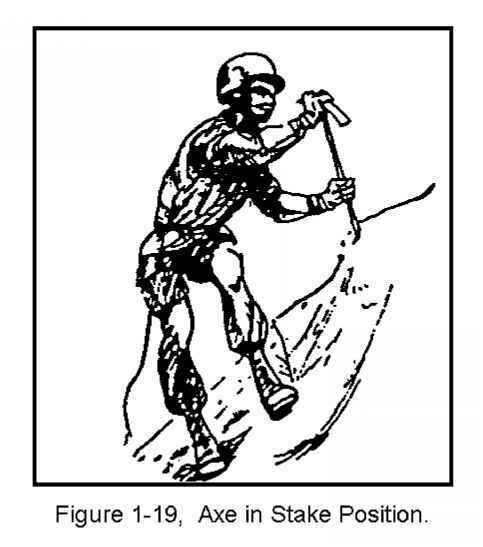 Hold the ice axe in the uphill hand as depicted in Figure 1-23. Figure 1-20. Use of the Axe in Port Arms Position. Step cutting on snow. 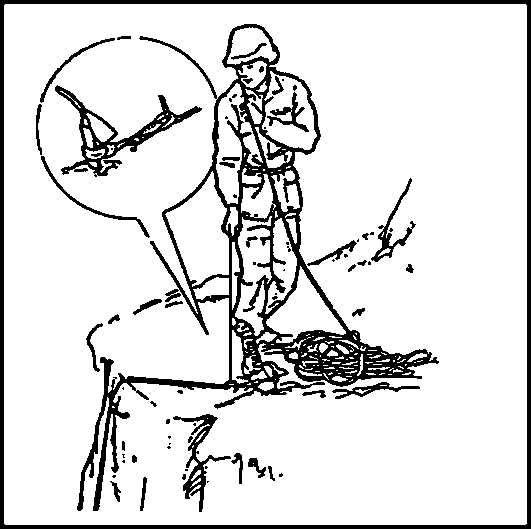 Step cutting is a valuable technique that is a required skill for any military mountaineer (Figure 1-24). 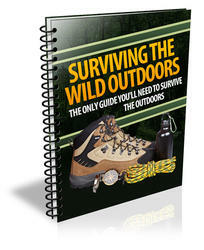 The use of step cutting can save time that would be spent donning crampons for short distances. On slopes of firm snow and soft ice, steps may be cut by swinging the axe in a near-vertical plane, using the inside corner of the adze for cutting. The step should be fashioned so that it slopes slightly inward and is large enough for the entire foot. Steps used for resting or turning must be larger. Step cutting a traverse. 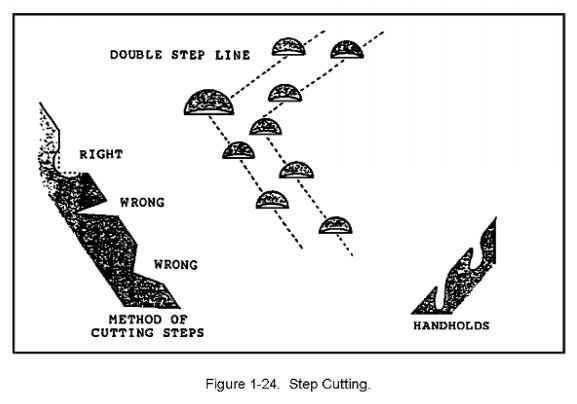 When step cutting a traverse, the preferred cutting sequence is to cut one step at an arm's length from the highest step already cut, then cut one between those two. This technique keeps all steps relatively close in a suitable interval. Handholds can be cut out, if needed, and should be smaller than footholds and deeply angled for the entire hand. If the snow is soft and the slope gentle, simply walk straight down. Firmly plant the heels and keep the toes splayed out in a herringbone. Keep the body erect, leaning back into the slope. Hold the ice axe in one hand in the cane position. Be careful not to step too hard into the snow and become stuck or fall. 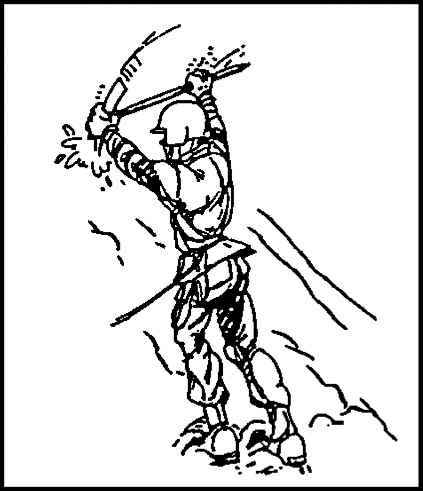 Do not over extend the ice axe, forcing the body to lean forward down the slope (Figures 1-25 and 1-26). • Security on Snow. The following principles apply. Security on snow is provided by the self-arrest and the self-belay methods. Use the self-arrest when a self-belay fails and you suddenly fall down the slope. Use the self-belay to prevent a fall while ascending or descending a slope. Place the ice axe shaft into the snow deep enough to remain in position and secure enough to support your weight. 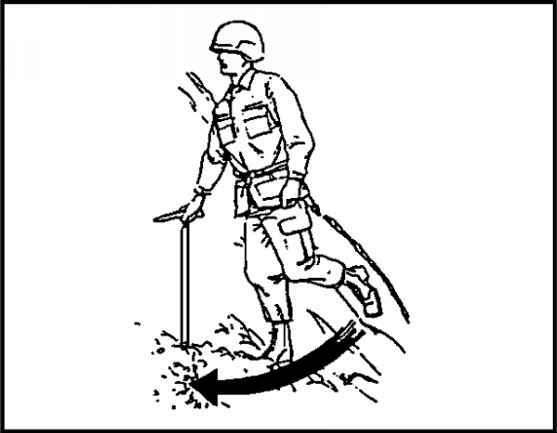 Move the feet only when the ice axe shaft is stable. Hold onto the ice axe at the snow surface level so as not to cause a levering action, which may pull the axe out of position (Figure 1-27). Hold the palm over the adze end with the thumb pointed toward the pick end. Walk up to the ice axe and reposition it one arm's length to the front. Immediately after falling, get back on your feet and continue climbing. • Snow Anchors. These consist of snow anchors, pickets, wired snow anchors or flukes, snow bollards, ice axe anchors, and secondary anchors. Snow anchors are used for ascending and descending snow slopes. While ice lends itself to more solid anchors, if snow is properly used, it can be just as secure. Pickets driven or buried into the snow can provide reliable protection. Snow composition should be firm enough to support the weight, shock, and strain of a falling climber. Snow pickets should be used in pairs, one behind the other, for added safety (Figure 1-28). Wired snow anchors or flukes consist of a light metal plate similar to the blade of a shovel with a wire sling attached. 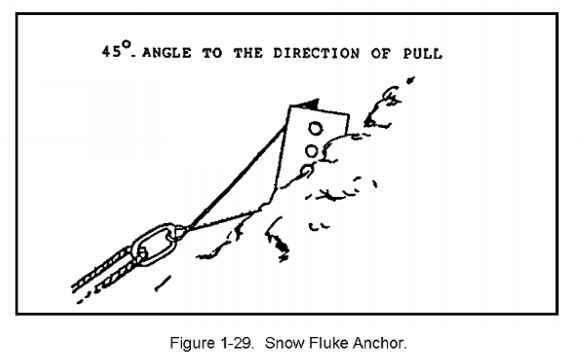 When driven into the snow, a pull on the fluke forces the blade deeper into the snow (Figure 1-29). Wired snow anchors should be used in pairs. Figure 1-2S. Snow Picket. Snow bollards are made of snow. Their strength depends on the texture of the snow. The reliability of dry or wind-packed snow bollards should always be suspect. Bollards are constructed in an oval, horseshoe, or teardrop shape hump or mound that is stamped or chopped into the snow. The smallest size in hard snow is 1.2 meters (4 feet) in diameter with a 30-cm (l-foot) inside trench. On soft snow the bollard should be 3 meters (10 feet) across and 45 cm (18 inches) deep. Loose granular snow should be scraped away to a stable layer. The inside trench should be undercut to form a lip inside the bollard collar. The bollard's oval shape should be in line with the expected direction of pull. A flat webbing runner, with padding against the snow, reduces the friction and sawing. The runner and rope should be moved as little as possible to avoid wearing the bollard (Figure 1-30). This anchor must be watched for deteriorating snow, which makes the anchor unsafe. Ice axe anchors are driven into the snow the full length of the shaft at about a 70-degree angle into the slope. This provides protection for a man on belay. By standing on the head of the axe to ensure it does not pull out, the climber can use the ice axe for many applications. The ice axe anchor requires constant attention and should not be left unattended. Secondary anchors are a must, especially in soft snow. They are positioned several feet apart, so that if the primary anchor fails, it will not weaken the snow around the secondary anchor. The snow composition and time available dictate which type of anchor to select. Changes in temperature and use effect the strength and security of snow anchors. Therefore, constant attention is given to all snow anchors to ensure they remain safe to use. • A two- or three-man rope team may travel in line or on separate parallel tracks. The weakest climber should trail in the ascent and lead in the descent. On gentle or moderate slopes where there is little chance of a serious fall and the danger of encountering snow-covered crevasses is low, all climbers move at the same time. Normally, the climbers move in single file and avoid climbing with one man directly above another, unless the possibility of an avalanche exits. arrest procedure. By using this method, called the team arrest, a fall by one member of the party is arrested by the entire party. Whenever a climber is belaying, he should tie a safety line and attach it to a piece of protection, which is separate from the belay-climbing rope protection. 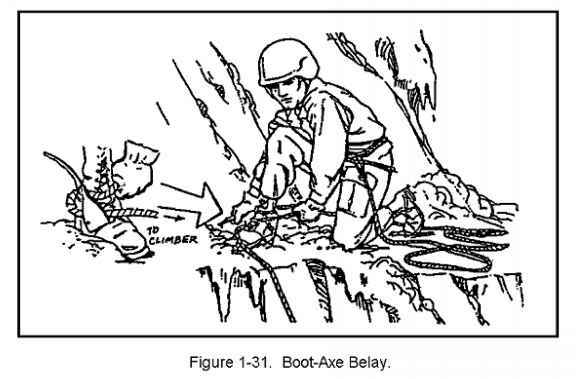 • Boot-axe belay. This type of belay is the least secure, but it is the easiest and quickest to set up. Stamp out a firm platform. Drive the ice axe into the snow down to the head, tilted slightly uphill at about a 70-degree angle. Place the uphill foot below the ice axe, and parallel with the pick to prevent it from shearing out. Position the downhill foot in a stable, well-braced position. The uphill hand is on the adze in the self-arrest grasp. Cross the rope over the toe of the uphill boot, place around the ice axe shaft, and back across the uphill foot's instep. Manage the rope with the downhill hand (brake hand), while keeping the uphill hand on the top of the axe head to prevent it form popping upward. Brake uphill around the ankle, forming an "S" bend. Concentrate your body weight on the axe and the foot bracing it. Brace the downhill foot for balance and against the downward pull. Pull the slack downhill with the brake hand, allowing the slack to run downhill; taking up slack requires practice. Slide the brake hand uphill toward the axe. 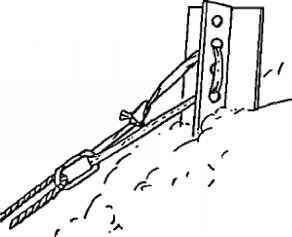 Maintain control of the rope, never allowing the brake hand to leave the rope (Figure 1-31). • Standing snaplink-ice axe belay. This technique is easier for managing the rope. Stamp out a secure area and bury the ice axe shaft to the head. Tie a girth hitch to the shaft with a nylon webbing loop. Insert a snaplink into the loop and route the climbing rope through the snaplink. Place the uphill foot on the webbing and point the trail foot downhill. 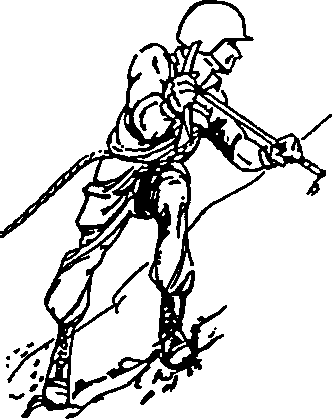 Bend the knees slightly and perform a standing hip belay (Figure 1-32). • Sitting hip belay. This is the preferred method of belaying. The principles are the same as for the sitting hip belay on rock. Use solid anchors and assume a well-braced position. • Stance. 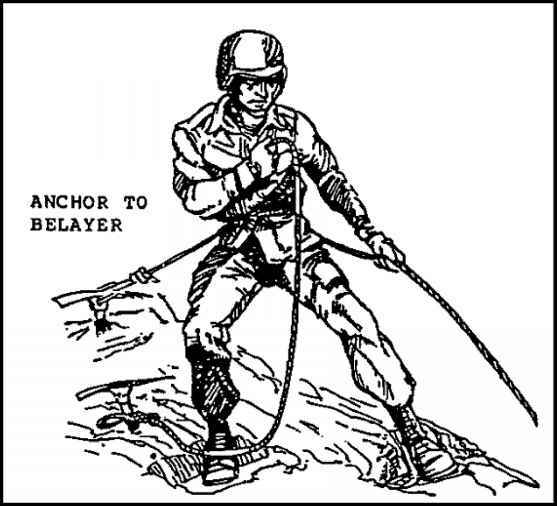 The belay position should be such that the shock load is taken by the belayer rather than the snow anchor alone. Position the anchor well above the stance, so that the pull on the anchor is minimized. Cut a ledge to stand on and stamp out a level area. Where the slope changes from steep to near horizontal, move back from the lip before belaying (Figure 133). Movement over ice without snow can be dangerous due to water, ice and crevasses. Although the ice can provide an easy and safe route on glaciers, ice climbing occurs wherever water freezes on slopes. This may include snow melt and subsequent freezing, frozen waterfalls, glaciers, and ice fields. Ice climbing may include portions of ice, rock, or snow, and combinations of these. The composition of ice may change, as will the slope and weather, but it still remains ice. Different techniques may be used depending on the angle of the slope, ice composition, weather, light conditions, and equipment available. How to use a snow picket while mountaineering? How to set up a belay of an ice slope? How many ice axe holding position hd photo?